US Sec. of State announces 'we won't be rushed' a night before the deadline, on last day for a deal before Congress gets double review time. 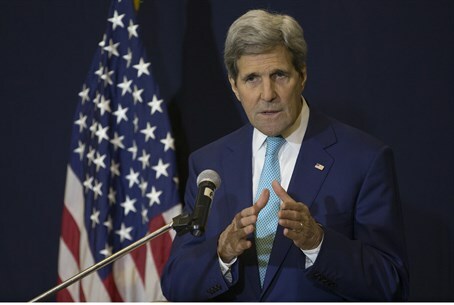 US Secretary of State John Kerry on Thursday evening in Vienna gave a public statement updating on the Iran nuclear talks, a day ahead of the twice extended deadline for a final deal on July 10. Kerry said that "we will not rush, and we will not be rushed" into making a nuclear deal, while adding that the talks are "not open-ended." "We shouldn’t get up to leave because the clock strikes midnight," said Kerry, qualifying that by saying, "we are not going to sit at the negotiating table forever. ...If in the end, we are able to reach a deal, it has to be one that can withstand test of time." He emphasized that "significant process" has been made, but noted that "tough issues remain" and that a deal has yet to be finalized. Kerry emphasized that difficult decisions need to be made soon, indicating a desire for Iran to show flexibility in its demands. According to an agreement between US President Barack Obama and Congress, if the deal is finalized by Thursday, the US Congress will receive 30 days to review it. If it is reached a later date, Congress will receive 60 days to review it. This would provide a great advantage to critics of the deal. During the review period, the US government will be unable to lift sanctions on Iran, which has demanded that all sanctions be lifted as soon as a deal is reached. One Iranian official admitted on Thursday that "God only knows" if a deal is close, reported AFP, echoing comments attributed to US President Barack Obama a day before by a senior Democratic senator, who said Obama believes the chances of a nuclear agreement with Iran are “less than 50-50." The talks, which have been meandering since an interim agreement was sealed in November 2013, have continuously been tense, with major differences existing between Iran and world powers. It has been estimated that the latest extended deadline of Friday will be the final deadline, after American officials said Tuesday that there won't be another extension. If a deal is sealed on Friday, it will coincide with Iran's "Death to Israel Day," officially known as Quds Day or Jerusalem Day, in which Iran organizes rallies around the world in a call to destroy Israel. Major disagreements in the talks have included Iran's refusal to allow inspections on sensitive nuclear sites, its refusal to disclose the military aspects of its nuclear program, and in a newly added demand, Iran has called to end the UN arms embargo on the Islamic regime.